Two of our most spectacular seasonal destinations are making a comeback as early as April 18th! 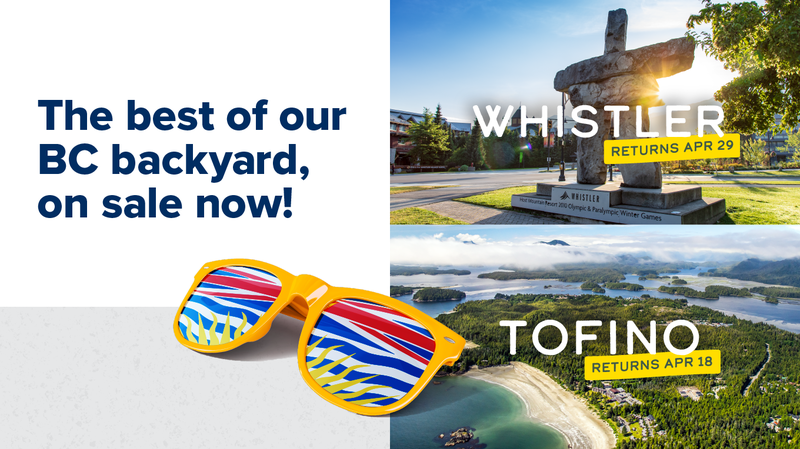 And, to celebrate the return of our Tofino and Whistler flights, we’re offering some of our best fares with a special Best of BC offer, exclusively for BC residents. Don’t miss this opportunity to plan ahead and save on a trip to the iconic BC mountains or world-renowned Tofino coastlines. This summer, visit two of BC’s most renowned getaway destinations for up to 40% off when you book ahead! Book by April 30th for our very best fares on travel all season long. Seats are limited so book now and see what your BC backyard has to offer! Click here to view our VR video Tofino! New route for 2019 – flights between Richmond (YVR South) and Whistler! Click here to view our VR video of Whistler! Booking is easy! Simply look for “GoFlex – Special” fares when booking online or via our new mobile app, or call our friendly reservations team at 1.800.665.0212. Don’t wait, book your perfect BC escape today! A limited quantity of “GoFlex – Special” fares are available on each flight. Once they’re gone, they’re gone! This offer is available exclusively for BC residents. Please be prepared to show proof of address upon check-in (e.g. valid BC driver’s license, recent piece of mail, etc). The “GoFlex – Special” fares will be subject to the amenities and policies associated with regular GoFlex fares. Changes to a “GoFlex – Special” fare reservation are subject to any difference in fare value. Cannot be combined with any other discounted or promotional offers. Discount is not valid for unaccompanied minors or on private charter flights. Offer valid for adult fares only. Discount fares cannot be paid for with Turbobucks credits.